Another xmonad related post! Have been coding a lot these days and using the terminal most of the times. Xmonad has been extremely useful in that regard that I think it will be very difficult for me to go back to any desktop. I have a couple of computers at home and though I was using dwm and xmonad infrequently over the last few months, now have become a complete xmonad convert. I also find configuring xmonad so painless that I am trying out some new stuff with my old machine at home! But for starters, it would be ideal to have some minimal info displayed on the status bar. As you will see in my scree, there are workspace info, local clock, a world clock (though Tokyo alone is displayed), and weather updates. Will upload my config files tomorrow for sure. Being a console junkie that I am, it is natural that I use mpd to organize my music, and ncmpcpp to serve as a frontend for the same. Calcurse on the other hand serves as a great tool for organizing my appointments and plans. I belong to the school of emacs, and hence that takes care of all my text editing, primarily programming, and tex document processing! If there are some people thinking about moving over to a tiling WM, I think, you folks should check xmonad out! I know there are a lotta stuff out there, like dwm, ratpoison, awesome, etc. but each of ’em has their pros anc cons! I found out that xmonad is my cup of coffee, but its’ likely some of you might have the same feeling about, say awesome and so on. But the bottom line is, try out a tiling WM, and prepare to be amazed. Here is my latest screen by the way! 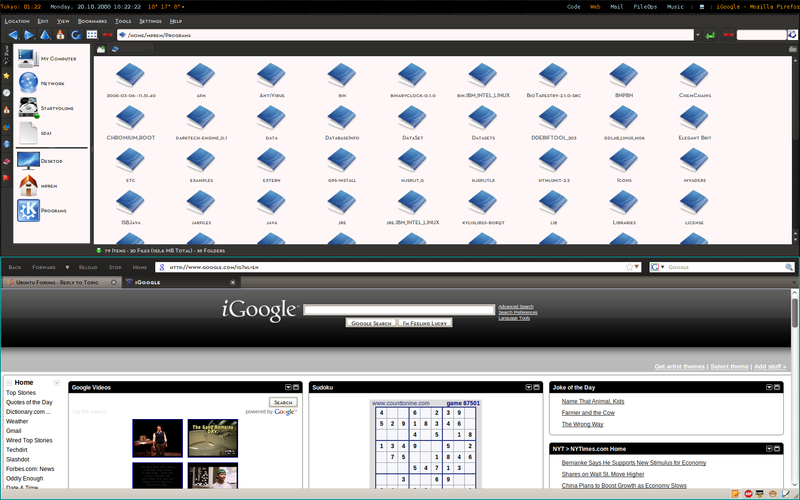 Firefox Theme – Dust; KDE3.5.10 – Dustonimo Domino Style, with Dust colors, and OS-K icons. Sidebar is baghira! thanx for the visit dave. the console font is Lucida console, size 8. in my opinion, it is one of the best console fonts that are out there! Terminus is also another great font. Droid sans mono is also exactly similar to Lucida console! My application font is Neutra SC Text. This is not free though, and if you google it, u might come up with some links! 😀 But if u don’t find it, lemme know, i can send ’em to ya! What transparent terminal do you use? What program do you use to set the wallpaper? thanx for the visit T.M. the terminal is nothin but good ol’ gnome terminal with transparent background. i use feh to set the wallpaper. feh shud be available in most of the linux distributions! hope that helps. What are you using for the calendar and todo lists? Looks lovely in the side of ncmpcpp. No probs void! its called calcurse! it shud be available in most of the repositories of many standard linux distributions! i know for a fact it exists in arch and ubuntu reps! hope that helps! nice font, how call it?